This is the last of a five-part series about the “stages” of personal finance. These stories have intentionally been less polished than most articles at Get Rich Slowly. This is a chance for me to think out loud, to explore an idea with you in an informal way. Initially, I was fumbling in the dark, spending compulsively and accumulating debt. Eventually I saw the light and began to repay my debt. After a hard slog, I reached the light at the end of the tunnel: my debt was gone and I began to save. Now I've entered new territory. I have a plan, and I'm sticking to it as I reach for my eventual destination: Financial Independence. Financial Independence is my ultimate goal. It's the state in which I will no longer have to worry about money. I would have enough saved so that I could do whatever I pleased. But what exactly does this mean? One of the underlying philosophies of this site is that different things work for different people. We each have different goals, different strengths, and different weaknesses. Though Financial Independence is the goal for many Get Rich Slowly readers, we each mean something different by it. 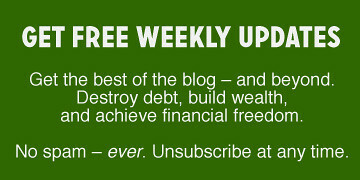 In Yes, You Can…Achieve Financial Independence [my review], James Stowers states: “No person is free, in an economic sense, who does not have adequate investment income entirely unrelated to work.” In other words, Financial Independence means that you earn enough from non-work income to fund your current lifestyle. I think this is the traditional definition of the term. When you are financially independent, the way money functions in your life is determined by you, not by your circumstances. In this way money isn't something that happens to you, it's something you include in your life in a purposeful way…Financial Independence is being free of the fog, fear, and fanaticism so many of us feel about money. If this sounds like peace of mind, it is. Financial bliss. And if this sounds as unattainable as being rich, it isn't. Financial Independence has nothing to do with rich. Financial Independence is the experience of having enough — and then some…The old notion of Financial Independence as being rich forever is not achievable. Enough is. Enough for you may be different from enough for your neighbor — but it will be a figure that is real for you and within your reach. With Vision we understand further that money is a conduit through which our souls flow into the world. We have produced as much as we personally need. We discover within us a capacity to reach out farther than we have ever imagined toward meeting the needs of our families and communities. We find no obstacle between what we want to accomplish and what we do. Aloha conveys kindness, generosity, at-one-ness, and compassion…We give without expectation of return, understanding that living is giving. We know both the limitations and the power of money, yet money no longer agitates us. We rest calm before it. In that calmness we can serve one another from the natural generosity that lies within and waits to be offered tot he world. In some ways, Financial Independence is just another term for retirement. Think about it. Most people retire at 60 or 65 because that's when they have enough saved to last the rest of their lives. If they don't have enough saved, they continue working. If they manage to save the money earlier, then they retire earlier. When you retire, you're essentially declaring that you are financially independent. What will Financial Independence, the fourth stage of money management, mean to me? Will it be a purely monetary state in which I have enough investment income to do whatever I like? Will it be the point at which I have “enough”? Or will it be something deeper, more spiritual, as suggested by George Kinder? I don't know. In fact, I don't know if I'll ever actually reach this goal. But I intend to stick to the path, working my way through this third stage of personal finance, hoping one day to reach that destination. Your turn: What does Financial Independence mean to you? If you were financially independent, what would you do? How would it change your life? Is this one of your goals? Why? If not, why not? There are 46 reader responses to "Financial Independence: The Final Stage of Money Management". I’ve been a subscriber for a while now, but have never enjoyed a series quite as much as this one. I know you intentionally claim that these are less “polished”, however I am very impressed by the feel and style. I look forward to the rest of your journey towards this last stage. I have a feeling the closer you get the more you will begin to favor a lot of Kinder’s observations. Whether you eventually make it or not, I implore you to continue to write series in this voice. For me at least, it’s connected more than almost anything on the site. Keep it up! J.D., I’m really enjoying this series of posts and love the nuanced definitions of Financial Independence you presented. It can mean so many different things to different people, depending on what their goals are. I’m ending stage two and entering stage three myself, where I’ve seen then light and have paid off my debts (except for the mortgage) and am in the process of laying out a plan to get me to Financial Independence. Good luck to everyone in reaching their goals of Financial Independence (before age 65). Reading blogs like this is a great step in getting there! For me “FI” is having a large enough portfolio to pay for basic living costs. I’m in a good situation, but not one that makes me happy. I have a nice salary in a field that doesn’t excite me, so my plan for financial independence puts me “retiring” early from this job and into a job that I’ve always wanted to do (I have 2 picked out, I want to start a brewery, or start a landscape design company). If the new job takes off, great, if not, I’ll do it until something else makes me happy. That’s what it is about to me… I can’t believe what I’m about to say, but Bob K. says it right (ahh! ), when he states financial independence is a ticket out of the rat race. The trick is that I need to do this without impacting my wife and son (1 income household here) so that’s how financial indepence plays into this. I need to be stable so that I can play around with my dreams. Financial independence means only thing to me: Never having to work again. Or, more specifically, never having to do any work that I don’t enjoy again. It’s definitely one of my goals and I’m working hard every day on developing my writing skills to become a bestselling author and successful screenwriter to accomplish this goal. I love writing so much that I’ll still do it when I’m FI, but I won’t focus at all on what I think people will want to read or watch at that point. Great series, J.D.! I agree 100%. So one question you can ask yourself is how can you make “enough” smaller? You may be happier with a lot less than you think. I’m still not a fan of this concept, like I’ve mentioned before. Part of the reason was presented in your article — you gave three different definitions for it. If you can give a word any meaning you want, that means that it has no inherent meaning of it’s own. The term “Financial Independence”, on its own and unqualified, means very little. Even if you take one of the seemingly common definitions, which is essentially “I have enough invested so I can live off the interest”, you’re not independent, you’ve become a slave to the stock market (or wherever you’ve invested) instead of your work. What if you hit your goals for financial independence in 2020 and retire, and in 2021 the stock market does the same thing it did in 2008, and falls by half? What then, do you go back to work for a few more years? Do you change your lifestyle to reduce your expenses? Neither option makes you independent. I think I will retire someday, but retirement and “financially independent” mean two different things, as well. Retired means “I have stopped working”. Plenty of people retire without being able to afford it, and struggle to make ends meet in their old age. Financially independent means “I can afford to retire”, but you can be in this stage and still work, if you want to. I know I just defined financially independent in my last paragraph, after complaining about it’s lack of definition, but even “I can afford to retire”, is a pretty vague notion that says more about how comfortable you are with your finances than it does about how safe they’ve made you. I continue to save for retirement, but with no expectation that I’ll want to maintain my “current lifestyle” at 60 or 70 years of age. In fact, that notion sounds ridiculous yo me. My current lifestyle includes planning to start a family, for instance, and my biggest time usage outside the house is 40 hours a week at work. I don’t know how someone can plan their retirement around maintaining their current lifestyle when, by definition, retirement is a huge change in lifestyle. My goal is to remain financially comfortable — meaning not needing to worry or stress about money. This doesn’t mean I try an maintain my current lifestyle, but that I spend within my means and save enough to get through rough spots. If rough spots are long, I can downsize my lifestyle, temporarily or permanently. If I have a surplus, I can increase it a bit, cautiously and responsibly. If I stop working while I’m physically and mentally capable, I can go back to work if I feel it’s beneficial. Working for an honest living has never been something that I despise like so many others seem to. All this doesn’t decouple me from my money the way that financial independence implies. My goal is to do the most I can with what I’ve got, and not exceed my abilities. It’s not to pick some unchangeable lifestyle and try to sustain exactly that for 30 years on inherently unreliable investments. It is definately more than just being able to “buy whatever we want”. I think of financial independence” in more of a spiritual sense. I currently spend a great deal of time away from home for my job. Although I love my job, I only do it because I need to support my family and myself. Being in a financial position so that I work because I wanted to and not because I “had” to would be my definintion of financial indepenence. I love Tyler’s perspective on this. I’m the first to admit that I can’t stand Your Money or Your Life, and one reason was because I couldn’t get a handle on working, scrimping, saving for something as vague as their notion of Financial Independence, which seemed as dependent on bond rates and the price of various goods and services (i.e., externalities) as anything else. For me, I love my career, it aligns with my values and talents and sensibilities, and one I want and can pursue for a long time. For me, FI means being able to continue to live in such alignment – and not just with paid work, but with other aspects of my life and interests. We reached financial independence in our 40s. What surprised me most about this stage is that we found we actually need much, much less that we did when we were working. So many of the things we paid for were “rewards” for working. Just maintaining our lifestyle in a busy urban area where the jobs were was expensive. Now that we can do what we want, what we want costs very little money. Because of this, when our portfolio took a big hit last year, we didn’t stress out. We now have a much better idea of just how little money we need to live on. We could cut our budget back quite a bit more if necessary and it wouldn’t feel like a hardship, just a change. I am firmly convinced that buying less leads to needing less in my life. Ironically, we often work harder as retirees by volunteering than we ever did for money. We both enjoyed our high-tech work before retirement, and volunteer in ways that use our intellectual skills. We do Red Cross disaster relief, and it is the most exhausting, challenging, exhilarating 80-hour work week! And yet, neither of us wants to spend money as a “reward” after our 3-16 week stints. The emotional benefits of financial independence are so far-reaching that we simply slip back into our now “normal” life of spending little, but enjoying much. So why would someone who has reached this final stage be reading your blog? Financial independence isn’t something that I planned for, but came upon me suddenly out of sheer luck. (My husband’s story is much different; he did indeed plan and work hard to reach this stage.) I am fascinated and awed by the process that other people are going through to consciously reach this goal. Frugality appeals to me now. I’m lucky that I went through the 1st stage of money management when I was in my early teens. I’m 22 now. The thing is, I’ve always hated work so much that I wanted to be able to stop doing it as soon as possible (being lazy is a good thing when it comes to personal finance… to a certain extent). This pushed me to save a huge percent of all the money I’ve ever gotten. I have a 2006 Mazda 6 paid off, $65,000 left on my mortgage, and $13,000 in savings right now. I make $45,000 a year and am planning my finances out so that I never have to work again by the time I’m 40 at the latest. Life shouldn’t be spent working your life away. Another great contributor to my savings account is the fact that most of the things I do for entertainment are cheap or free. The internet, tv/movies, studying languages, and exercise pretty much encompass what I do with my free time. To me, being financially independent means have enough money in the bank/investments so that you don’t have to work. I’m not a greedy person. I don’t have a strong desire to have millions or billions of dollars. I just want enough so that I don’t have to spend my days doing things that I don’t want to do. For this reason I don’t plan to ever have kids. They are a huge drain on resources and pretty much guarantee that you’re not going to be able to retire until you’re old and gray. Tyler – part of being “financially independent” (regardless of the definition) is to know enough about your finances to keep yourself in that financially independent state. If you are about to retire and have all your investments in equities then you are taking on a huge risk which can work against you in a big way. One “rule of thumb” is to have 5 years worth of expenses available during retirement so that you can get through a bad patch in the equity markets. I’m really enjoying this series of articles. I’ve been debt-free for a while now (thanks in no small part to this site! ), and I’m really not sure what to shoot for next. I’m guessing financial crossover would be the next logical goal, but getting there seems unexciting. Thanks for these posts JD. I enjoy both the style and content. I’ve never been in debt and was brought up learning how to manage my money, and actually majored in finance in college so I was in step 3 immediately upon earning an income. Now, 20 years later I feel I have a good start to financial independence, having saved a great deal – I can weather many storms that others cannot. To me it is a feeling of freedom – being able to finance your needs with what you have. In retirement, I hope to be able to do what I want – vacations, a home in a warm climate, volunteer my time, visit my family, and not have to worry if I have the funds to do any of these things. In other words, my portfolio will take care of my needs and my wants. I agree with KS – I, too, have a career that I enjoy so much that I would keep my job even if I had a windfall large enough to live on investment income. Besides, it has retirement and disability pension entitlements that would let me carry on even if I became unable of working tomorrow. I would nevertheless like to take a sabbatical some years from now to travel the world, and I do not have that money saved up yet. So my last stepping stone to FI (I would go with the definition from YMOYL), is the “sabbatical/travel fund”. Your Money or Your Life is the book that motivated me to stop spending way above my means (using credit) and begin tracking what I spend and also what I really need to be happy. I, personally, love the concept of ‘enough’. How much do I need to spend to get to ‘enough’. How much do I need to earn to get to ‘enough’. How much is enough for me? It’s going to be different for each person, as these comments illustrate. For me, FI means being debt free, being able to work part time (or not at all), and having ‘enough’ investment income to finance a modest lifestyle. My definition of a modest lifestyle will differ from someone else’s, but I don’t think that means the concept is meaningless. I’ve paid off my credit cards in the past year, have increased my income, am finishing a graduate degree in order to bring even better opportunities into my life, and am actually looking forward to beginning the battle against my monstrous student loan debt (incurred as part of my bachelor’s degree and first master’s degree—my current degree is financed in cash). I can’t tell you how my life has changed since finding this blog, beginning my own blog, and reading wonderful books like YMOYL and Dave Ramsey’s Total Money Makeover. I plan to track down the two other books you’ve mentioned in this post, J.D. (I borrow from the library these days, rather than throwing down the credit card at Amazon.com or Barnes and Noble). 1. Financial Independence is a goal that most people have in their 20’s and 30’s. It is a dream that most have that they will do this and that. It is not easy to achieve this goal, but a few do make it to this stage. The millionaire books will tell you that if you ‘own your own business’ and ‘run it with passion’, you have a very high likelihood of achieving it. 2. Retirement is something that people generally seek at at 60 to 70. That is when the company finally says, here is a golden parachute, and you get off the train. This is true for a very large number of low and middle income families. The upper income category fall in the next bucket. 3. Retirement for a few who are high income earners are able to take a package and quit much earlier since they are the very high income earners, and get off the train quicker. A lot of them will go back to consulting as and when called for, but generally they consider themselves self-sufficient and retired. 4. Again, here a lot of young folks in their 20’s and 30’s and 40’s will think/talk/discuss EARLY RETIREMENT, but very few who even reach the ‘financial levels’ pull the trigger since things are going well in the career and they do NOT see the need to quit. 5. As a result of all of the above, I feel that Retirement is a stage of life that one needs to get to with ALL debts paid off for at least 10 years, all future large one time bills being already accounted for with funds allocated to those goals, and still an income stream coming in. This is the stage where if the job is going, then it is great. IF the job is gone, that is OK also. Here is the stage where the ‘positive cash flow’ of 10+ years is now invested in a really wide range of asset classes, some of them stable enough to pay a consistent dividend. I am in that final category after starting with $3000 that my Dad gave me when I started working at age 23 in the US. Today, I have an approx annual stream of income from my investments that I can count on coming in every year (from various asset classes, regardless of the economic situation) of approx $51K. My expenses without any debts (including teenage kids that consume a lot), is approx $38K-$39K including everything. This puts my family life in a situation where if the job goes, so be the will of God, and of course, after doing everything to hunt for another, I am not going to have a drop of sweat, and neither do I need to dip into savings to live a life. Remember, that I have bagged lunches, have had water at restaurants, repaired everything I could repair, driven old cars (still driving my 1992 car), and done everything I possibly could to be at this stage. If you think you cannot do it, you will be surprised…..It is just a way of living, and sacrifices are small, but rewards are huge. For example, I could have survived with family in a 1750sq ft home, but we upgraded to a 5500sq ft home a few years ago. It does not sound like a sacrifice, but my kids still bag their lunches, and make ice-tea from home as their drink. Good luck to all and God Bless…..
You know, JD, you’ve been working towards this for longer than you realize. To some extent, you were already “financially independent” enough (whatever that means) to leave the box company and pursue your dream. Until I read this entry, I didn’t consider us “financially independent” either, because in the strict sense of the term, we’re not. But like you were when you left that box company, we were “financially independent” enough for me to leave a job with decreasing satisfaction, and a new 3-3.5 hour commute (my company moved in July 2008, I left in Jan 2009). I WILL have to work again, and I may not even be as well paid as I was. But it had become untenable, and I needed to leave (after 18 years at the same company). Maybe there are smaller spurts of “financial independence” along the way to literal “financial independence”? What do you think? Kenny. You have done very well and seem happy. But I have to admit, there is a huge difference between a 1750 sq m home and a 5500 sq m home. I don’t know how many kids you have. We have four, and we raised / are raising them all in our 2200 sq m (paid off) home. So I was curious. No offense meant, for sure. Thanks Debthaven for your comment…..All of this just comes with financial independence and going for what the family wishes. We doubled the price of the home we sold, but our previous home was paid off, and the new home was purchased without selling the previous home. ALL of your decision making process, and the methodologies that people ‘commonly use’ goes out the window when you have saved for a goal, BEFORE you go an achieve the goal. It goes along the same line that I teach my kids…..Have the cash in your pocket to buy your ‘need’, and then charge it on the credit card, so that you can use the banks money for 35 to 45 days. I have two teenagers who will be going to college in 2-3 years so we wanted to enjoy a big home while they are still young. The thing I am sharing on this forum is “have the money, think 3.5 times before you define your need, and then think 1.5 times before you search to buy, and then hunt aggressively for coupons/deals/offers, and then buy with credit card”. This approach will get you EVERYTHING you want in life, but one will sacrifice some time to do that thinking and research. I hate people saying to lots of things “Its only couple bucks” or “Its only 10 bucks” cause that is how money slips away. I tell my friends to total up the ‘gross earnings’ x ‘number of years worked’…..Match that to your Net Worth (assets minus liabilities). It puts everyone to shame (including me) when I do this. I defined my way of thinking about Financial Independence. Have we achieved it. Yes, in a way. But, I live well within my means so that I can teach my kids the same. America needs to learn this well and as JD has posted many time “More With Less” is a lesson we have to learn and teach our kids. Even our home decision is more with less, since we bought a home that was $150K less than the other ‘prestige home’, but we settled for less by convincing ourselves that we will get a used Lexus to park outside our home for $25K. So, went to a dealer auction and got a $40K Lexus for $22.6K + taxes with a few miles on it. MORE WITH LESS. Just my 2 cents…..I have much more to learn which is why I read all of the stuff by JD and many more sites! Good luck everyone……Strive for Higher Goals, and You Shall Achieve! UGH, I lost my long comment and response to Kenny! Long story short you can raise two or three or four kids with very different values! You can “teach” till you’re blue in the face, but you can’t “make them learn”! That has been our experience. DS1 is in grad school and saves every penny, had done charity work on three continents in three years. DS2 is in business school and burns money like nobody I have ever met before or since. Since they were in HS, they’d get cash gifts from their rich grandparents / dad. The day after, DS1 would be on the computer booking his next airline ticket somewhere, DS2 would be buying clothes. They have had a basically identical education, and both always lived here with DH and I except for the one year DS2 lived with his dad before he asked to come back here. I’m not stupid enough to believe money burns a hole in DS2’s pocket because he lived with his dad for one year when he was 10 (ie 10 years ago). I love them both to bits, but it never ceases to amaze me how different they are. And yet they’re best friends. All this to say, all we can do is our best. At the end of the day, none of us have control over how they turn out. My DS1 has the same financially cautious, but “go for it” attitude to life I do (or rather, did). Spendthrift DS2 would take the shirt off his back for anybody, he has risked his life many times saving people at the beach, he is a very good soul, but his attitude to money drives me nuts, lol. All this to say, it’s not because you teach them what you call “your values” that they will learn what you expect them to, lol. In a nutshell, I’ve always tried to teach my kids to be careful with their money, but that “an experience is always worth far more than a thing”. I’m sorry, I’m being really verbose. DS2 (10) came home down from school the other day. They were looking at old photos and other kids realized he had the same winter coat he had two years ago. They teased him. It broke my heart for him. I told him to ask all those kids with their new winter coats who teased him, how many of them flew to Florida two summers ago to swim with dolphins? All the best to you and yours! Raising kids is never easy, but you already know that, lol! Financial independence moves with your age-IMHO. We are very comfortable right now. We will be working at an 8-5 job for two more years to sure things up- and then off we go(at 54 and 60). Both of us have taken substantual breaks during our lives (several years at a time for various reasons). The idea of financial independence is knowing that you have enough to enjoy what you want in life. Fortunately, what we enjoy is family, woodworking and volunteering. Already did the big travel, but there is no reason we cannot save our “allowance” and travel when we want. We have lived on the same budget for five years now. Envelope system. Works for us! BTW- debthaven- a Two year old coat? What is wrong with that? If it fits and is clean- the people teasing about the coat need to learn about finance now- or debt will be their calling card. Oh, yes…..I am talking about the job I am doing. I am not sure if my younger one is going to heed 100% of the advice. Hence I am trying to give 200% examples, thinking, that a sum total of 80% of that will rub off. Both my kids are very different. The older one will follow it to the T, but the younger will make more money and spend more. BUT….. They both realize that when they get 2x to 3x that they have asked for, after waiting for a deep discount sale, and still we have saved 50% of the original planned amount (at Aeropostle or Walmart or Buy.com), they are learning a lesson that may NOT get implemented between 16 and 25, but the lessons are not forgotten. In either case, we want to make sure we follow very disciplined methods first (lead the way), so that they will follow it at some point in time in their lives. Showing them use of credit cards, and then how the bill payment system pays it off (100% of the charges) at the end of the month, shows them how to do it ‘right’. Credit card were created for avoiding cash around, and not for ‘borrowing’. We have forgotten the orginal reasons. I am with you completely, except when my kids wear winter coats till they cannot be worn, or shoes until they prove it cannot be worn, I teach them the value of ‘need’. When we replace those shoes, we hunt 3 stores, and buy what meets the ‘need’ and not the ‘want’. My teenager kids get a regular dose of ‘need vs want’ lessons with the proofs of CDs, and Pre-paid College Statements to prove that money comes from these kinds of sacrifices. No amount of teasing will affect my kids, since they have ‘pat answers ready to fire back’ (programmed these answers a LONG time ago!). Maybe, I am too far into the ‘proving’, but I always tell them, that I might have a different way than others, but, I am open to even better ways. That is what brings me to JD’s site, and I have forwarded numerous articles to them from JD…..I want to learn better ways of saving and spending, and how to keep it balanced. Keep on trucking…..There is a pot of gold at the end of this road – Trust Me! I think there are few things in life more discouraging than spending years at the same low-level job (in my case, 13 years), while your friends are pursuing *careers,* that they enjoy at least to some extent. I have a bachelor’s degree in English, but my job has nothing to do with it. I have been a compulsive spender for my entire life. I knew enough from my dad not to accumulate debt, but I spent every single penny of every paycheck on “stuff,” to make me feel better. And most of the “stuff” was going towards fleeting hobbies to make up for my lack of fulfillment at work. Like Shanel above, I am now committed to writing, to finding a career I want to pursue with passion. If I can successfully publish a book or several short stories, I plan to cut my work to part time and focus more exclusively on the writing. To me, this is Financial Independence. It is the freedom to break away from what you’re not, in order to be who you are. J.D., this has been an inspiring series for me. I’m still young but your blog has continually challenged my beliefs. People around me are spending their money recklessly (or without direction) and are often at the brink of financial collapse. When I talk to them about money and investments, they shrug it off and tell me I’m thinking too hard about the future. They also tell me they will seek education when they’re ready. That’s how I approached money a year ago. What I’m happy about is that I kept on seeking education because I knew I should start now and fail miserably while I’m young rather than grow old and have nothing in the bank. Thanks to GRS for the encouragement and the advice. I’m currently taking a riskier route because I can afford to do so at my age. I’m investing in stocks rather than CDs. I get this feeling that when I talk about it to my peers, they will tell me tons of cautionary tales. All of this should one day lead to my financial independence. For me, this stage of personal finance relates to a life of fulfillment and purpose. A life where I would be doing something I love. Right now, I am not entirely sure what that is. Thinking about it, financial independence is an elevated state of contentment where one has enough and is able to pursue his interests. Sometimes, it’s so hard to pin a value to this state of being. I could have a million dollars in the bank and still live a meaningless life when I reach retirement age. This leads me to think that financial independence is part of the process of finding my ideal self. The accumulation of wealth is important, but it should never overshadow the quest to fulfill my deeper desires and dreams. Without discipline and constant self-examination, it is practically impossible to reach financial independence. I do have to disagree on one point, though. I don’t think financial independence is another name for retirement. There are plenty of people who retire and can’t actually afford it, and they end up going back to work. Retirement is simply the period of your life where you stop working and I think most people would like to be financially independent – whatever that means to them – at that time. Unfortunately, that’s not always the case. But, to define it for me. Financial independence is the freedom to wake up when I choose, knowing that I don’t have someone keeping me on a schedule I don’t want. I hope I reach my goal of financial independence before retirement because there is plenty to do and see in this world and I’d like to do it before I’m too old to enjoy it. But, there are plenty of things in this world that I want to do – and get paid for – that even if I was financially independent, I’d still do them. It’s all about choice for me. I’ll continue to write, even when I’ve achieved financial independence because I enjoy it. But, I don’t want to work at the credit union for the rest of my life. It is everyone destination to have financial freedom, prior to that steps one must value the meaning of spending their money, keep efficient and only buy things that is requires.Just living simple, don’t you think living simple is healthy? At some point most people have to give up work, because they simply are not fit/well enough to work any more. Lots of people would prefer to not have to work before they get to that stage. Whether you then choose to work anyway is besides the point I think. For me a lot of the financial independence stuff is all about removing the fear that I’m going to be homeless and begging on the streets one day. That’s really not a likely scenario, but if I was less reliant on employment for my income it would become even less likely. Financial Independence for me means that I will have the freedom to pursue interests and business ventures I have without impacting our current lifestyle. My idea of financial independence is not relying on an actual job to support my lifestyle and my family. It also means being completely independent of creditors and debt. When I eventually become financially independent, and no longer require the typical 9-5, I’d like to donate 15-20 hours a week to building homes for habitat for humanity, and give free courses to parents on educating their children about how to become financially responsible. I think you can never be fully financially independent. You could define it as not having to rely on a job, but then you still have to rely on the stock market, interest rates, business profits, sales/property tax and inflation not getting too high, and/or, if you’re living off the land, having reasonable farming weather. Not to mention not getting expensive illnesses, getting sued, getting divorced, or other tragedies. Nevertheless, one’s freedom can be increased. I now have the freedom to do anything I want (though not _everything_ I want) so long as I keep my job. That’s awesome. And my job is not gruelling and I am appreciated and it pays well above minimum wage and it doesn’t require anything morally questionable, but it’s not something I’m that excited about (and yes, I am spoiled), so being able to unlock these golden handcuffs is my next goal. To do that, I am almost completely dependent on my pension fund. If that implodes, I don’t yet have enough other strategies to cover me for a very long time. I’m saving an additional 15% of my gross income for retirement, paying off my house, and that’s pretty much it. I’m actually saving a lot more of my income than 15%, but the extra is to make sure I don’t have to worry about things like my car or house needing repairs, my car breaking down for good or suddenly needing to replace all my appliances at once. I no longer buy anything until I have the cash (including cars); apparently that sort of freedom is more important to me than freedom from needing a job! The traditional notion of financial independence seems to be to accumulate enough assets (such as stocks, bonds, real estate) such that one can live off the income from these assets without having to work. Unfortunately, it’s not practical for all but a small percentage of the population. Why? Because it’s our work that generates the earnings that companies pay out as dividends or interest, that allows landlords to collect rent, and that allows governments to levy taxes and pay interest on the bonds they issue. If we all stopped working, there would be no earnings, no rent and no taxes — and hence no investment income. For us, financial independence is choosing to think and live in a certain way. First and foremost, it means realizing that happiness and self worth are independent of material wealth. Beyond a level that covers basic physical needs, more money or more “stuff” does not mean greater happiness. Second, it means spending less than we earn today, and saving for the unexpected and for retirement. Third, it means avoiding non-mortgage debt, and paying off our mortgage as fast as possible (less than 10 years to go!). Fourth, it means setting priorities for spending money that are in line with our values. We value good health, so we choose to spend money on a good pair of running shoes and a gym membership, and we cook most of our own meals. We support our local church. We don’t watch enough TV to justify a cable subscription. We don’t take out-of-country vacations every year. The end result of these choices is a fair amount of financial flexibility, and a greater appreciation of the things that do bring happiness — a terrific spouse, mutually supportive family and friends, good health, and work or volunteer activities that bring a sense of purpose to life. Find these things, and live life with an attitude of gratitude, not entitlement, and you will find financial independence. Having just finished reading the update to Your Money or Your Life, I would have to say that Financial Independence to me would mean that my passive income would cover my normal expenses, and that the loss of my job wouldn’t be catastrophic to my standard of living. this is an awesome series of posts. thank you. as usual, you’re going to get different definitions from different people. in my situation, my wife and i are working feverishly to pay down mounds of debt. we both wish we had done so in our 20s, but so be it. i’m nearing 40 and we have a 3-year-old girl. we’re teaching her about money and she has already grasped “save money, no debt” = a lollipop. we’re going to teach her as much as possible. we’re on a good path and will right our wrongs while teaching our child along the way. 1. Intermediate Stage: Completely debt-free including mortgage. 1 year emergency fund, fully funding IRAs. Yes, we would still be working jobs at this time but can afford to take risks in starting a business or taking minimum wage jobs if needed. 2. Financial Independence: Not working for a company. Income comes from a combination of businesses we own (and sustainable with little effort from us) and financial investments. This translates to having free time to travel and pursue personal interests. Our goal is not to retire but the above scenarios. I would also like to note that, personally, I don’t buy the idea of working hard (tolerating your job) and retiring 40 years later. Happiness is within you, not what you have or don’t have. Life happens here and now. Enjoy life more! I like what debtheaven said about smaller spurts of financial independence. I’m 26 and in graduate school – needless to say, I’m not near any sort of permanent financial independence. However, I have been careful with my limited funds, and was therefore able to take a couple months off from grad school (and therefore receive no pay through my assistantship) and spend time with my family at a time it mattered most – without having to worry about how I’d pay my rent. I’m now looking for a job, and I find I can be just a bit pickier than other new graduates because I have no debt and enough money in savings to get by for more than six months (longer if I move in with family – and/or tap my “down payment for future house” fund). While I don’t want to have to tap that, the freedom of knowing that I can means I’m a lot less stressed than most people. So, at this stage in my life, mini-financial independence (i.e. having the freedom to face up to a year of no income without incurring debt) is fine by me. Obviously, I aspire to more, but for a student, I’m very pleased with where I am. Financial independence is writing full-time…without having to eat Ramen noodles or KD. To me, financial independence means not having to rely on a job to pay the bills. It means I’d only work if I was bored and needed something to do or actually loved what I did. Great post! I love the definition of financial independence in Your Money or Your Life and work toward achieving it by focusing on “Bang for the Buck” (i.e. spending money on things I get the most pleasure out of, i.e. traveling, and cutting those that are less important to me, such as eating out at fancy restaurants). While I still have a ways to go toward financial independence (and certainly toward being rich) small changes and keeping up to date with the great info on your blog are helping me along! Financial independence to me is being able to do what I want without having to have a conventional job. I guess the definition isn’t totally black & white for me. First I thought it would mean not having to work, but then again, I hope to have my own company one day, and I don’t know if I’d consider it “working”, necessarily, if it was what I wanted to be doing. I guess being able to set my own hours and have enough in the bank so that if I didn’t want to “work”, I wouldn’t have to, is what I consider financial independence. I’d not worry about bills, I’d have my house paid for, and so on. It means doing what I love, without needing it to live. Like Plonkee, I’m working so I’m not homeless on the street. I don’t know that I’ll ever achieve financial independence, though, short of six feet of ground to call my own. Moneymonk, since I see Financial Independence as very nearly ultimate freedom (except for that six feet of ground), how do you define it so that you come up with “boring life”? I think “freedom from fear”; I suspect you must be thinking of something else, and I wonder what it is. OK, so here is a mathematical / objective way of looking at FI. I am pretty detailed about what I am doing since I am in this stage of life where I have set my goals to be an FI more than 23 years ago…..
TAB 1: I generated my own customized spreadsheet that totals all of my annual expenses, and reverse engineered how much money I need to set aside in a diversified asset mix to cover those annual expenses. This means that the income will cover the annual expenses, and when I jump over to heaven, I will leave all of those assets behind for my kids! TAB 2: I took all of the potential one time expenses that I would encounter, and then reverse engineered how much money I need to set aside in a diversified asset mix to cover those expenses (coming in blobs), and when I jump over to heaven ‘most’ of those funds will be left behind for my kids! Anyone serious to take FI to the next level of objectiveness, should do this exercise by themselves. To me, FI means being able to make major life decisions without finances being the primary determinate of the outcome. (i.e. My decisions are independent of my finances.) I am not sure when that will be, but right now we still have a mortgage and 3 young kids, so we definitely are not there yet. An example is that when deciding if we will take a vacation this year, our finances were the primary consideration. I love this post. It’s so rich (ha ha!). Seriously, it’s a downright spiritual take on money, and so well said. To me, pragmatically, financial independence means having control over money, rather than it controlling you, living within means, and dveloping alernate avenues to acquire revenue should your income be cut off. For the part about learning to manage money as a teen, I thought I’d offering up my blog for further discussion. I’m a college professor and journalist specializing in teaching kids about money management. My blog is Ask Anne–giveme20.com/blog. FI to me: that I can die and know my family will be fine. Financial Freedom is that stage where I don’t want to die because I can help others by using my finances. Life insurance happens when FI and FF are still goals. When I can cancel that, I have reached FI, and am working solely because I love it.